These architectural photos were shot for a construction company’s portfolio. Most times I would avoid a noon hour shoot but this one worked out well. The design’s long lines reminded me of some of the buildings from the early to mid 20th century. The northern exposure provided some nice shadow areas for contrast. The landscaping provided a nice compliment to the building’s front entrance. 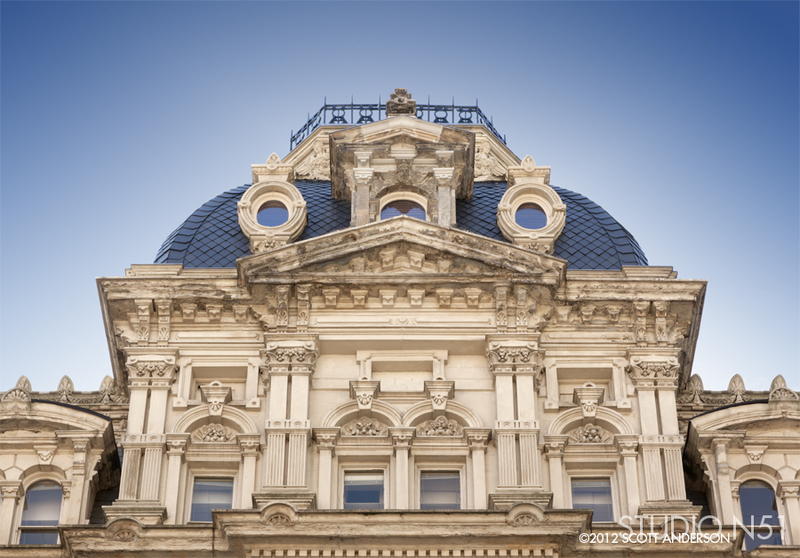 Kenosha County Courthouse architecture photograph. Photo taken 10/7/12. I shot this architecture photo a couple times. The landscaping was in process during the first two visits so I ended up retouching the image a little to help it along. The grass was partially finished so I cloned some of it into place being sure to provide a compressed and softer look as the grass moved out of the focus area. The flags were at halfmast so I needed to bring them up for the client’s final photo. On the final visit for this shot, the landscaping had wooden stakes with bright orange ribbons to keep pedestrians off the new grass. Great for the grass – bad for the photographer… These were shot on the weekends to avoid any parked cars or people around the entrance. While this shot had the dramatic wide angle look, I also provided a couple with a normal look. The street lights were a little tricky to shoot around so I provided a couple options. I shot this photo for Langer Roofing. This is from a series of architectural photographs for a calendar used to promote the company’s visibility. The company handles high and steep roofs like church steeples and high rise buildings. Architectural photograph of the new Alterra Coffee Shop. Photo taken 9/23/12. I was a little surprised to see this Alterra coffee shop on my building photo list. 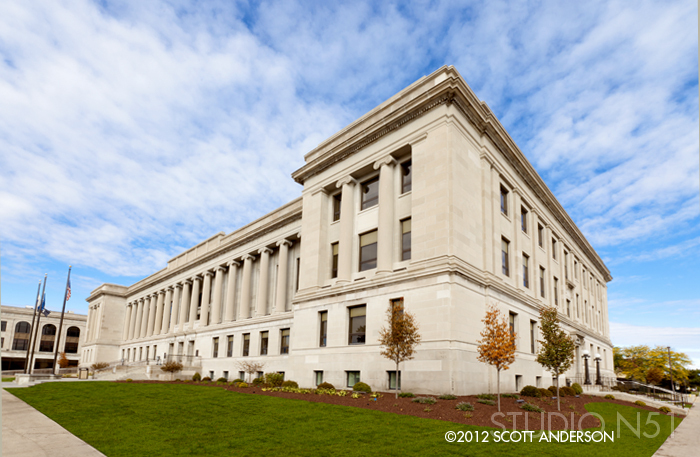 I usually shoot larger structures for this client. This was probably the biggest coffee house I’ve been in. This building photo was a little more challenging due to the north facing wall – but it had a really cool bakery inside. They have stools lined up along the baking area so you can have a coffee and watch how they make all the baked goods they sell in the front of the shop. I had a little bit of time before the sun went down behind the building so it was a great place to wait it out. I had a huge cookie and a parfait – I was stuffed. This was located at 2301 S. Kinnickinnic in Milwaukee. This was another photo from the same day. 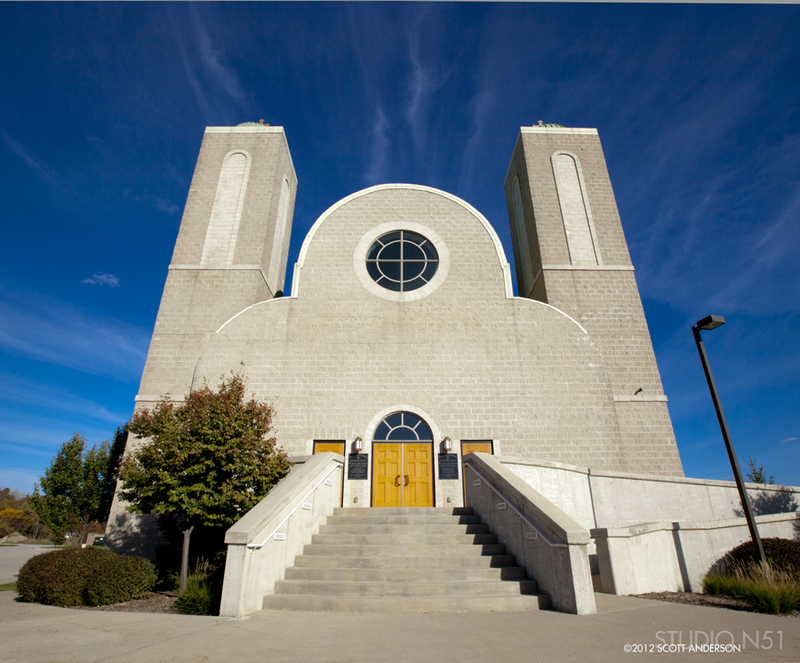 The architectural photo was taken fairly close, so the wide angle lens provides some nice vertical movement toward the sky. As I mentioned in the previous post, I really like the way this building is designed. While the roof sections were modern in materials, it still reminded me of some of the old churches I had seen in Mexico. 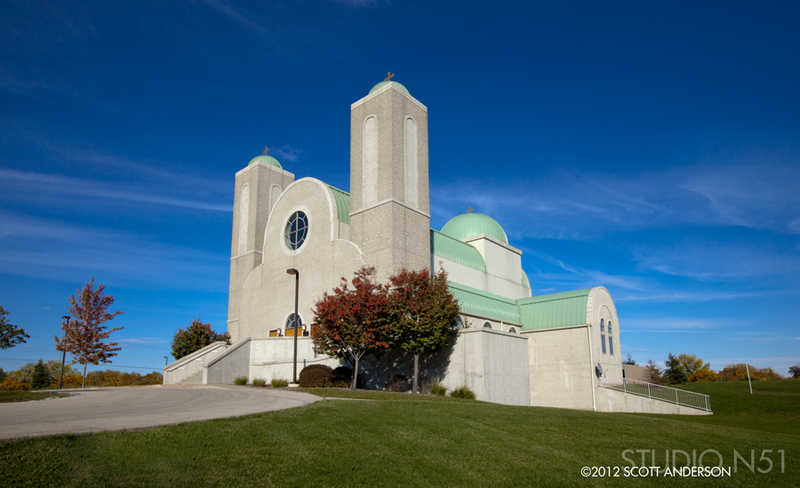 St. Mary and St. Antonious church in Oak Creek. Photo taken 10/7/12. 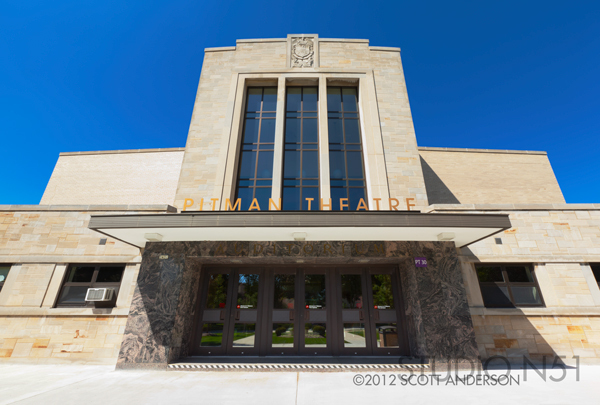 I shot this architectural photo on the way back from a photo assignment in Kenosha. I pass this building all the time on the way to Chicago. It’s one of the more unique church designs and I always thought about how neat it would be to shoot a photo of it, just never had the time. As I came home, the light was just right so I pulled off and took a couple exposures. A nice way to end the day.